ASIAN WHITE BIRCH is Nov 2016 Plant of the Month – Glacier View Landscape and Design, Inc.
Twenty or more years ago, Boulder Colorado landscapers planted a lot of Aspen trees in landscapes to bring the mountain feel to the plains. People gravitated to the idea and liked the feeling it brought to their yard of a serene mountain setting. However, the Aspen just are not well suited for life on the plains of Colorado. It is too dry, too hot, and the soils generally contain too much clay for the Aspen to thrive. And, because of this, they have become susceptible to disease, mainly aphid gall and then a fungus which kills them off throughout entire neighborhoods at a time. This landscaper has found a substitute, and is vastly more than that. It is a solution to the look and feel of Aspen, without the pitfalls. Asian White Birch, also known as Whitesprire Birch (Betula platyphylla ‘Whitespire’) is an amazing tree and is very similar in appearance and growth habit to Aspen. It is native to Korea and Japan. They have white bark, fluttering rounded leaves, golden fall color, are available as multi-stem material, and grow to a similar height and width as the Aspen, approximately 40 feet tall by 15 feet wide. However, they are much more suited to the Colorado environment and clay soils, are more disease resistant, and have similar water requirements to Aspen. 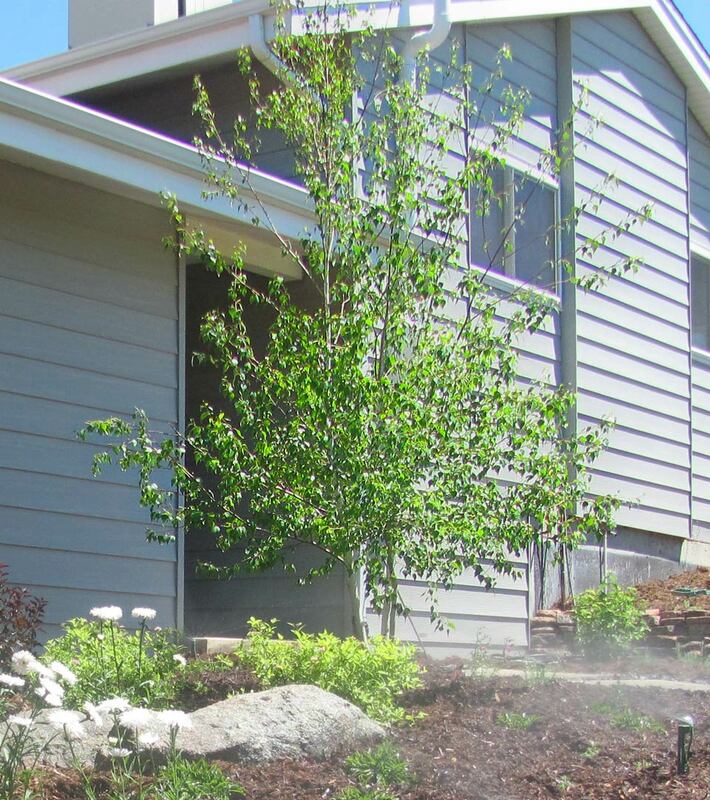 One advantage that often comes up in tight spaced neighborhood yards is that they can tolerate wetter conditions than the Aspen, so they can be planted in a drainage swale or low spot on the property. Asian White Birch tend to be harvested with rather large root balls, so digging and planting them will require a little more effort, but the results are well worth the added work. They like full sun, but can tolerate some shade too. As with all new tree plantings, over dig the hole, add amendments to the soil, and water thoroughly. Staking is not required with multi-stem trees, and with the larger root balls, the trees tend to be bottom heavy anyway, so they are usually fine without stakes. Replace your dead or dying Aspen trees with Asian White Birch to bring back that Colorado mountain landscape feel to your home on the plains.